El Corte Inglés is a world leader in large department stores and a benchmark of Spanish distribution. El Corte Inglés has more than 70 years' experience and has been able to maintain its policy of customer service, while adapting itself to suit the tastes and needs of society. In addition to the El Corte Inglés department stores, the Group has other chains, such as Hipercor, Opencor, Supercor, Sfera, Telecor, Viajes El Corte Inglés, Bricor, Óptica 2000 and Informática El Corte Inglés, among others. Lot's of opportunities to find Fashion items at great prices at the El Corte Ingles Fashion Sale Verified this week. Valid until further notice. El Corte Ingles discount code not required. Verified this month. Valid until further notice. 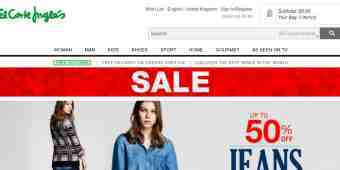 El Corte Ingles discount code not required.